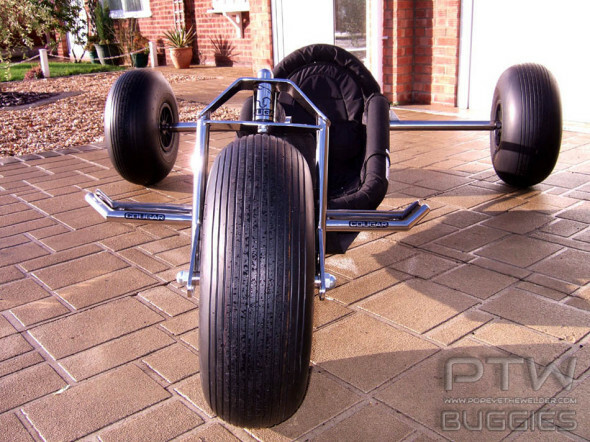 The PTW Cougar was my first real attempt at making a worthy race buggy, with asymetrics on the rear, bigfoot lite on the front. 1530mm by 48mm rear axle, 1750 wheel centres front to back, 60mm by 40mm swan, 470mm high side rails out of 33mm tube, and wieghs in at 47kg. 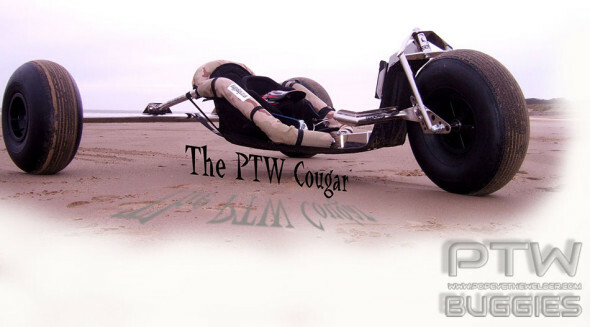 The PTW Cougar. With thanks to Jerry from “Race kites”, for the decals and cougar T-shirts, and Jon and Helen “Buggybags” for the side rail, Back rest covers and TSG. Many, many thanks for helping me out with the finer details, top quality products. Feb 25 2007 12:21 am Nice work PTW! Very shiek and sleek!! as usual…………..stoaked!! Feb 2 2007 02:01 pm You should be very proud, a nice piece of work. Bravo I need to do the same, hard to get buggies In Canada. Jan 19 2007 10:47 pm Looks good but it will be interesting to see how long it takes you to break the forks where the tube joins at the top, not much strength in that section for the type of buggying we do. Jan 19 2007 04:20 pm The smile you are wearing in that pikkie kinda says it all. Well earnt. Top looking Bug. Jan 19 2007 09:08 am Yeah Carl,really great one,looks nice done again. Jan 19 2007 08:03 am That really is stupidly shiney 😛 i wouldnt want to get it dirty!!! Nice work! Jan 19 2007 06:00 am WOW ! So when they going into production then ? When,s the first one coming off the line ? And how much will they be ? I know !I know ! If I have to ask I cant afford ! But nice to dream !!! blimy!!! That looks mint!!!! can i have a go??? Holly WoW!! That looks the dogs whatsits…can I get one? wow thats stunning whats the diffrence from the panther???? It’s like watching Orange County Choppers, all that shiny steel. Where did you get all that sunshine from? wowza, iv been cheking your site for a while watching th eprgression, great to see how good it looks now. had chance to test it yet? or to worried the shine will go? i would be!!! bet those kites are as clean his buggy…. Nice lookin bug there popeye, great web site too. If the Buggy handles as good as it looks you’ll have em queuing round the block. I’m 1st……Can i try before i buy? How many man hours did that take??? that looks like its one hell of a beast but can it hold a good line??? phoar, hats off to you Carl! 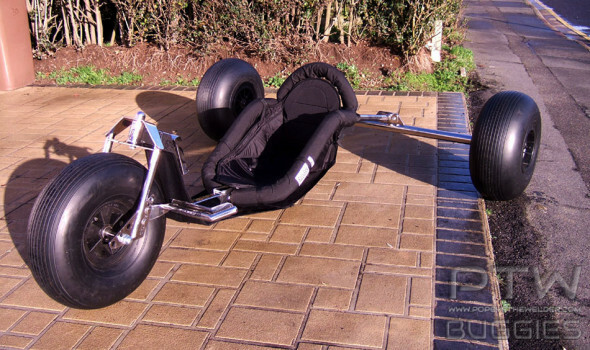 This buggy does look a tad nice! OMG this should be nominated for a design award! Only one criticism………er! Do you want to swap it for my wife.Lovely girl,$hits anywhere. I dont do buggies but I have to say that is one great looking machine you have constructed there Popeye . Maybe you should make a “Plinth” a bit like Top Gear did for their Toyota Hilux? Then it will really stand out & the little peeps behind the massive crowds you pull with it will be able to get a look too. nice buggy Carl, great explanation on how you did on your site, either your single or you must have a very sympathic family for the hours of polishing gone into the frame LOL. The Mutz Nutz of buggies Well done Carl. Popeye,slick machine dude,in the process of having my own built,you,ve pinched all the cool names,so maybe i’ll call mine The Moose,or Goat,perhaps The Foxtrot, but i’ve only just got most of the bits,so right now its The kit.Like your’e buggy build info,that will be very useful,though i have my own ideas,the technical info will be valuable,keep on rocking Popeye,cheers,Pete. Carl, I thought the last project was brilliant. You have surpassed yourself. Attention to detail? You can be well rpoud of what you have produced. Top job mate. Just too good mate! Love it. A work of art Popeythewelder. I have sent my critique to your personal e-mail address. Let me know if I’m being too hard. Popeye I reckon you should start a little youtube blog called “pimp my buggy” where people with crap buggies bring them to you and you pimp them up. Of course it would have to include some amateur dramatics and someone attempting to rap for it to be the real deal! Maybe one of those 500 Sky TV channels that shows nothing but crap mite be interested in sponsoring it? Or maybe Tim Westwood is so desperate for a gig he mite do it? mmm the possibilities! 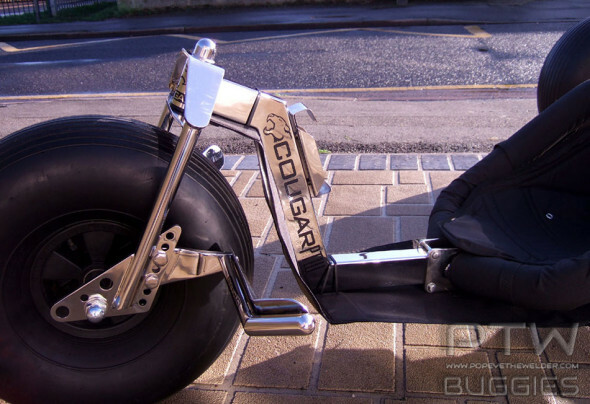 Oh by the way, im not a buggier, only had a go once, but that Couger looks really sweet! I was wondering – the structure on the front wheel looks over engineered, is this the case or is it quite efficient strength to weight? How does she ride? I imagine you have all the angles and lengths tweaked now cause this is your 3rd or 4th one? DAMN!!!! BRILLIANT!!! SMITHSONIUM IS LOOKING FOR YOUR NUMBER!!! How does it compare to the Panther? That is such a nice buggy. Well done! that is an exceptionally beautifull bug! WOW That is one nice piece of beachwear you got there Popeye. Bling Bling. The CF decals just finish it off nicely. What did you use to get the polished finish that is so labour intensive. Brilliant work. 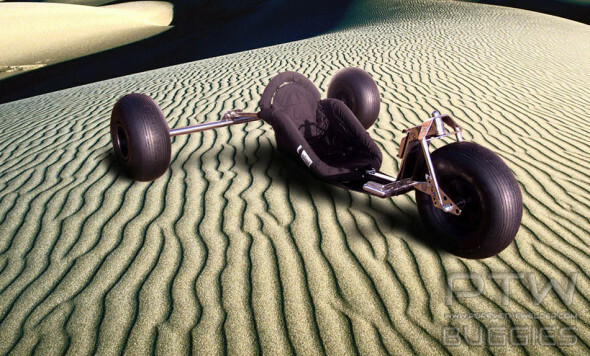 Sweet buggy carl, Out of this world!! Fantastic job and I hope you make some time to get it on the beach. Popeye you truly are committed to the cause!!! How many hours do you put into making a bug? I know its more than people think for sure. For me the most impressive thing is you have the technology and know how but you just post your drawings on your site for all to see. This is a sign of a master of his trade. Fantastic bug and awesome webbie. Nuff said. A truly awesome looking bug….. nice work and what a skill..!! well done. Carl – do you take credit cards? Carl, Another outstanding Job. Well done mate. 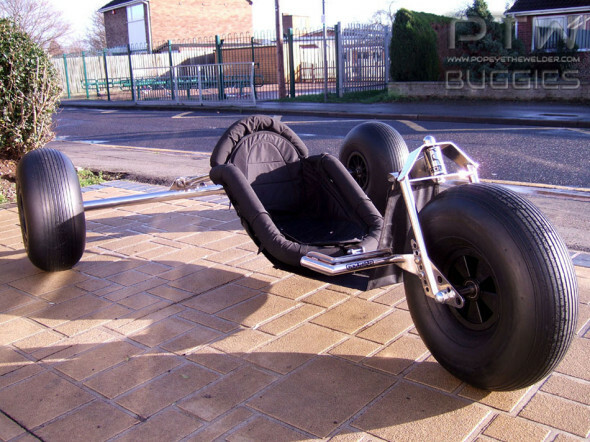 That is a truly amazing buggy. Edit: After looking at your pictures, I’ve changed my mind. It needs a new word. But mainly for detailing your Cougar costs!! !